Welcome to the WD4SCD repeater Page. This page will help you use the repeater for best results. 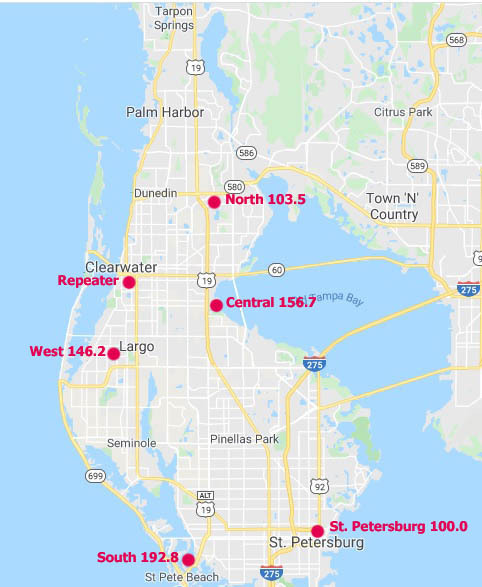 This repeater system has four receivers located throughout Pinellas County. Each receiver is selected by the USER. Select the proper CTCSS TONE to access the closest receiver. The Tarpon receiver is 100.0. The North receiver is 103.5. The Central receiver is 156.7. The East receiver is 82.5. The South receiver is 192.8. The West receiver is 146.2.
during threat of SEVERE weather. This page was updated on September 25, 2013.